PARIS --- After several days of official dithering and dissembling, and conflicting reports and retractions from the US Air Force and the F-35 Joint Program Office, we have determined that the JPO’s account of the F-35’s first transatlantic crossing was wrong. 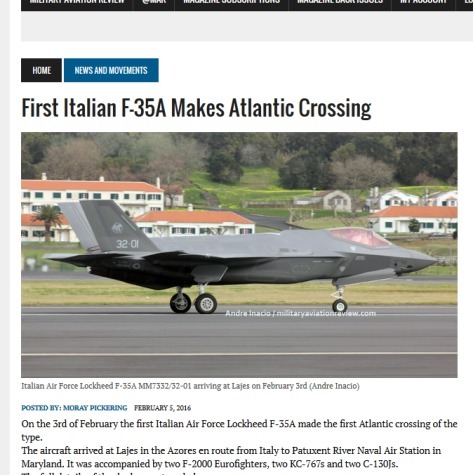 The Italian F-35 left Cameri (Italy) on Feb. 3, landed at Lajes Field in the Azores on the same day, spent 36 hours there because of adverse weather, and took off for Patuxtent River on the morning of Feb. 5, landing there on the same afternoon. JPO’s account claimed the aircraft left Cameri on Feb 4, overnighted in Lajes, and arrived at Pax River on Feb 5. Also contrary to initial reports, the crossing took 13 flight hours, and not 11 as initially reported by the JPO and by some media outlets. The JPO has acknowledged its mistake, but has provided no explanation. The Italian Ministry of Defence and its Defence Staff HQ have both denied that the aircraft experienced any “maintenance issues” at Lajes, as reported from Pax River by Defense News and Flightglobal. Admittedly, these discrepancies are not of earth-shaking significance, but they do show that inertia and gullibility are often enough to accredit false information, which is then set in stone for future reference. This item is intended to set the record straight. This is all the more important in this case that, except for the Italian agencies, all other sources deferred to the JPO's version of events, even when it was demonstrably wrong. This illustrates the control JPO exercises over all aspects of F-35-related information. Our initial report on the discrepancies in the initial official accounts is below. PARIS --- Much attention has been given in recent days to the first transatlantic crossing by an F-35 fighter, in this case an Italian-assembled F-35A belonging to the Italian air force’s 32nd Wing, and which was accompanied on its flight by Italian air force KC-767A tankers and other aircraft. Such a significant milestone in such a high-profile but controversial program should be fairly straightforward to report, but there are many inconsistencies and contradictions between the media coverage and the official reports of this event. Even the dates of the flight are in dispute, varying from 4 days in the first media reports to a single, overnight mission as claimed by the program’s Joint Program Office (JPO). Overnight, 3 or 4 Days in Transit? The first media report about the event, posted by FlightGlobal on Feb 5, said the aircraft had left Cameri, the Italian air force base near Novara where the F-35 is assembled, on Tuesday, Feb 2. It landed at Pax River on Friday, Feb 5, the story said. It is logical to conclude that these are the dates provided by authorities to reporters when they covered the event at Pax River, which Defense News used as the dateline for its story. Yet, when government agencies got involved, the flight was substantially shortened without explanation. In its statement on the event, the F-35 Joint Program Office shortened the flight to a single overnight stop at Lajes, and made no mention of the adverse weather. This version shaves 48 hours off the flight times reported by the trade press, and 24 hours off the flight time reported by the Italian air force and Ministry of Defense. “1. The F-35 departed Italy on February 4, arrived at Lajes on February 4, departed Lajes on February 5, and arrived at Pax River on February 5. 2. To the best of my knowledge, the flight time was 11 hours, but I am in the process of confirming that for you. Local authorities at Lajes Airfield, which alone could clarify the flight details beyond doubt, proved uncooperative. Contacted Feb. 9, the Lajes civil air traffic control declined to discuss a military flight, and referred questions to the Portuguese Air Force’s local Dispatch Office. The US Air Force’s 65th Air Base Group Public Affairs Office declined Feb 9 to provide any information about the flight, again without providing any explanation. The P.A. officer referred all questions to the F-35 Joint Program Office. There is no obvious reason why such mundane information as flight dates are kept under such tight wraps, but given the widely differing accounts of the event this level of obfuscation is generally used to hide unwelcome truths. In addition to transit times that vary from 2 to 4 days, there are also other discrepancies between the official reports and those published in the trade press. In addition to Defense News, other media reports mention maintenance issues. “The aircraft was due at destination on Wednesday, but weather conditions and some technical problems delayed the crossing,” reported Fly Orbit News, an Italian aviation website which also mentioned Feb. 2 as the date of departure from Cameri. In his post-flight interview, the F-35’s pilot, Major Gianmarco D., denied any technical problems, saying “We had 100% availability, we had no issues at all,” a statement he repeated twice in the same interview, which is posted in English and Italian on an Australian website. Most reports mention a total flight time of 11 hours, or 4 hours from Cameri to Lajes and 7 hours from Lajes to Pax River, but at least one, by another Italian website, AskANews, mentions 13 flight hours for the entire trip. However, the FlightGlobal story mentioned above quotes the Italian pilot as saying “We had the chance to fly for 15h with the KC-767 before crossing the pond,” and then adding “In 6h for the first flight and 7h for the second one” there were no technical issues – but this means the mission totaled 13 flight hours, not 11. Most reports also agree that the entire transfer required 7 in-flight refuellings, three during the first leg and four during the second. During the first leg, the F-35 refuelled three times; assuming it took off with a full fuel load, it consumed four fuel loads during the first leg, or an average distance of 418 n.m. per fuel load. During the second leg, the F-35 refuelled four times and, again assuming it took off with full tanks, the total increases to five, or an average distance of 448 n.m. per fuel load. It is worth observing that the second leg, which according to official reports was flown with “headwinds of up to 120 knots,” actually used less fuel per mile than the first leg, during which no adverse weather or headwinds are mentioned.